For service providers looking for additional level of protection or for new additional services for their Cloud Connect tenant, Tenants to Tape is designed to overcome the need for air-gapped backups. Tenants to Tape allows service providers to consume a Tape Library (a physical one or a virtual one) and to use it as a target for air-gapped backups of their tenants. 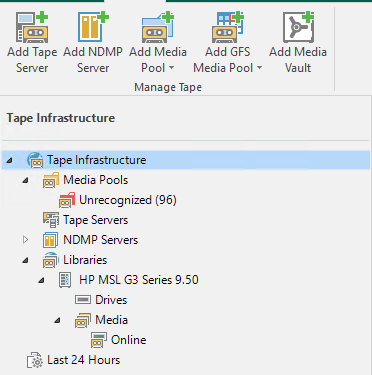 As a prerequisite, Tenants to Tape requires the presence in the Veeam Cloud Connect environment of a Tape library, and a tape server. The Veeam server is by default also a tape server, but following the design we suggested on paragraph 3.3 we suggest to deploy a dedicated Windows machine that will act as a Tape server and is located into the same STORAGE network. This machine can be physical or virtual depending on the used tape library and how this can be connected to the Tape server. Any tape library with proper Windows drivers is supported by Veeam Backup & Replication, thus also in Veeam Cloud Connect. NOTE: for additional information about Veeam and supported Tape Libraries, please refer to the Official User Guide. IMPORTANT: if you are adding the Tape Server to an existing Cloud Connect environment with strict firewall rules, you need to allows TCP/6166 between the Veeam Backup Server and the Tape Server. We will discuss in Chapter 7 which activities the Service Provider can do to fully leverage Tenants to Tape.